There is always something fascinating with some one else’s reading. It’s like ordering food in a restaurant and then seeing what someone else is eating; it always looks appealing. There are few readers who don’t try to sneak a peek at what a fellow commuter is reading. There are book groups that will discuss to a minute level the intricacies of a novel. And it’s always interesting to read other people’s views on books, after all you are reading this review (or at least I hope you haven’t stopped by now). So to read a whole book dedicated to someone else’s reading list seems like the ultimate bookish eavesdropping. 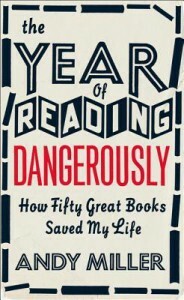 I had heard good things about The Year of Reading Dangerously and I was keen to pick it up. So I did what most book lovers do, bought a copy then let it sit unread on the shelf for a while. But then I started a reading challenge to read 20 books in 3 months and so thought a book about a reading challenge, during a reading challenge, was too apt an opportunity to miss. I had also been hit by a bout of reader’s block so I thought that reading about someone else’s book trials would help. And it did. I was of course eager to see which books Andy Miller had decided to spend his year with. Would there be many I had read and if so would I find that we had similar opinions about the books? 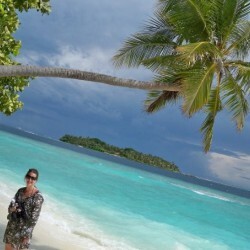 The answer – there were some books we had both read, some we agreed on and others our thoughts differed wildly. Now reading is a subjective matter, what one person will love, another will loathe. And it is precisely this subjectivity that make books so wonderful. All books have the potential to impart knowledge, expand our world view, warn us or entertain us. And they all have the potential to miss their mark. There were a variety of books that saw Andy Miller through his reading year. It was interesting to see the diverse range of books. The book encouraged me to dig out copies of unread titles or to at least consider reading them sooner rather than later. It was also pleasant to read about someone else’s struggle with books. And I mean that in the nicest sense. It was a relief to see that I was not the only one to sometimes find myself ploughing through a book others had loved. To have someone write a book about the fact that not every book can be universally loved almost validates the thing that readers know but don’t always acknowledge; you don’t have to love every book, or even finish it, and there’s nothing wrong with this. Whilst The Year of Reading Dangerously gave me an insight into possible books I’d be interested in, it also gave me leave to acknowledge those books I don’t fancy reading, and to not feel bad about it. I can live with the fact I’ll probably never read Somerset Maugham or any number of authors that others rave about. There is something refreshingly liberating to read about someone else’s literary ups and downs. As is always the case I sometimes found myself agreeing and then sometimes disagreeing with Andy Miller’s view points on reading in general and issues he had and things he loved about some books could just as easily be applied to the titles I read. Reading can be a solitary pursuit, though this is becoming less so with the rise of social media, book groups and literary festivals all opening up dialogues to discuss the books we love. The Year of Reading Dangerously is another avenue, another way to celebrate the written word. Now I’m off to pick up my copy of War and Peace and settle down with my 50 pages a day.